On a recent project with the agency DigitasLBi, I met two members of the publishing department whose role was to research and select an appropriate content management system (CMS) and then train the client’s team to create, manage, and publish content within the CMS. Although both publishers were interested in content strategy, they did not consider themselves content strategists. They were, they told to me, content technologists. This separation of content strategy from technology is not uncommon, but it is unnecessary. Content strategists are responsible for ensuring that the right content appears at the right time, to the right people, in the right places. Our content has to work for multiple users with a variety of devices, across myriad channels. For many content strategists, this is an overwhelming concept. As a result, they create either idealized strategies, leaving development teams to work out what is and isn’t feasible, or strategies that rely on manual effort or technology they’ve used in the past. In rare instances, organizations hire content technologists, as Digitas did – people whose job is to bridge the gap between content strategy and development. For most companies, that option is unrealistic and expensive. In the majority of situations, the content strategist is responsible for connecting the strategy to the development. For a small or simple project, strategists might pick a familiar CMS and plan a strategy based on its abilities and constraints. But the purpose of creating a user-centric strategy is to put the emphasis on the user’s needs, whether or not those needs align with the abilities of the strategist’s preferred CMS. 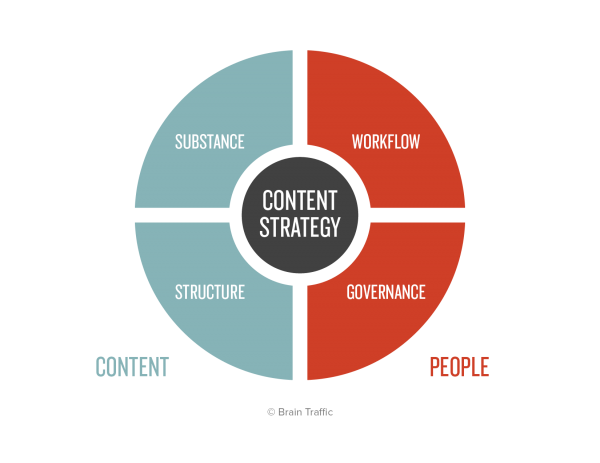 In 2010, the content strategy firm Brain Traffic presented the content strategy quad (illustrated here). This image identifies four components of content strategy, classifying workflow and governance as “people” components and substance and structure as “content” components. We’ll review these four components briefly and then – our final goal – identify how they relate to intelligent content. Workflow is a process followed by a team. A good workflow accounts for everyone who needs to have a say in the content without slowing down the creation process. Governance is a team’s process for managing content. Governance tactics streamline the editing and retiring of content according to when it stops being relevant. Substance includes the voice and tone as well as the message the content conveys. Structure is the one we’ll focus on. With the rise of “content everywhere” and the “Internet of things,” structure is intertwined with technology and development – which is to say, the content management systems we work with. We decide on a structure for our content, which informs the technology we choose, which in turn shapes the structure of the content. With these four quadrants, a strategist sets the stage for intelligent content. All four are necessary components, and yet, planning content’s structure is somehow more difficult than the other three. The first reason for this is that many content strategists are more comfortable working with people than with technology. Even substance, which is not a people component, is based on user research, speaking with people, and understanding how to communicate with them. In addition, content management technology is changing quickly. Few content strategists have the time to explore and learn about even a quarter of the CMSes available. Lastly, those in many organizations can’t visualize what they want until they see it, which creates a chicken-and-egg problem that too often leads to blindly selecting a CMS without first identifying the content needs. In short, many content strategists just don’t know where to start. How Much Technology Do Content Strategists Need to Know? Let’s take a look at a complex project: a large department store’s website. The store wants to create a personalized experience for customers. Management expects sales, advertisements, cross-promotions, and recommendations to appear for each customer based on his or her previous purchases and search history. The content strategist wants the site to display a combination of these four content types in a sidebar personalized for each customer, avoiding duplicates, overly generic content, and an empty sidebar. In a project like this, the CMS has to be chosen and designed to support the experience and the content. The content needs to be adaptive, the dev team is relying on the strategist to make CMS recommendations, and the site admin is going to need documentation explaining how to work with the CMS to manage the content once the site is built. In other words, the big question is this: How much of the technology does the content strategist need to understand to build a content road map? What we do need to know is how different types of plumbing will impact our end users. The most important thing to remember is that the technology you need already exists. There are enough content management systems out in the world to manage all the content from here to Jupiter, and more add-ons to each of those systems than anyone could possibly need. As a content strategist, you don’t need to know how to design a CMS, and you almost definitely don’t need your company to build a new one. You just need to identify what you want the content to do and then work with a developer to match those goals to the right CMS. When we stop trying to create a system from scratch and, instead, identify the goals and content needs, we move from a world of uncertainty to the more familiar world of discovery. With that in mind, don’t be afraid to ask questions! It’s almost impossible to come up with a content interaction that hasn’t been done by someone. Do you want users’ profile images to appear every time they leave comments on your forum? Someone has done that. Do you want customers who have already made a purchase to see a link to tracking information when they return to the store? Someone has created that module or plug-in. A CMS may not have all of the things you want. But it’s easier to find one that accomplishes most of your goals than to pick a CMS first and then look for work-arounds to accomplish your goals. Which brings us to how. How Do You Identify Your Content Goals? Create personas. To create intelligent content, you have to start by understanding the people for whom you’re creating the content. Walk through scenarios for each persona. For example, take a look at each screen in a given scenario, and consider what information is relevant for each persona. Think of content in terms of units (sometimes called content modules or content components). In the example of our department store, content needs to be created in sale units, ad units, promotion units, and recommendation In order for personalized pages to provide an optimal experience, we need to create content units appropriate for each persona in each scenario. For example, we need distinct sale units appropriate for shoe shoppers, pants shoppers, and coat shoppers. We also need content units for each persona in the scenario as a first-time buyer and each persona in the scenario as a returning customer (same person, same scenario, different point in the customer life cycle). Assign content units a “who” (the audience type), a “when” (the scenario), and – if necessary – a retirement date. Be specific, and descriptive. Depending on the CMS, the “who” and the “when” may become metadata tags or categories, or they may simply help new admins keep track of why each content unit exists. Identify a default content unit. If a website user has cookies blocked, or is an outlier who fits none of the personas, the site still needs to display content that is engaging. Default content deserves as much attention as personalized content so that no user ever encounters a generic, unconsidered page. Intelligent content doesn’t require content strategists to become content technologists. We need only accept that communication today is at least part science and work through the steps, beginning with identifying the content goals. 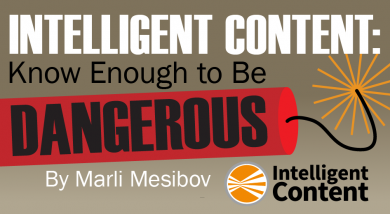 Sign up for the Intelligent Content weekly email newsletter. Not only will you receive our new posts, but you’ll also get an exclusive article from Robert Rose each week. Join the Intelligent Content Conference LinkedIn group. Plan to attend the Intelligent Content Conference. Marli Mesibov is the director of content strategy at the design and UX agency Mad*Pow. Her work spans strategy and experiences across websites, web applications, and mobile for enterprise companies and startups. She is the managing editor at UX Booth and a frequent conference speaker. Marli can also be found on Twitter @marsinthestars, where she shares thoughts on UX design, content strategy, and Muppets. You can learn more about her and her work at http://marli.us.